This program pairs contemporary repertoire with Early and Baroque Music including works by Max Murray, György Kurtág, Mark Andre, J.S. Bach and Guillaume de Machaut. 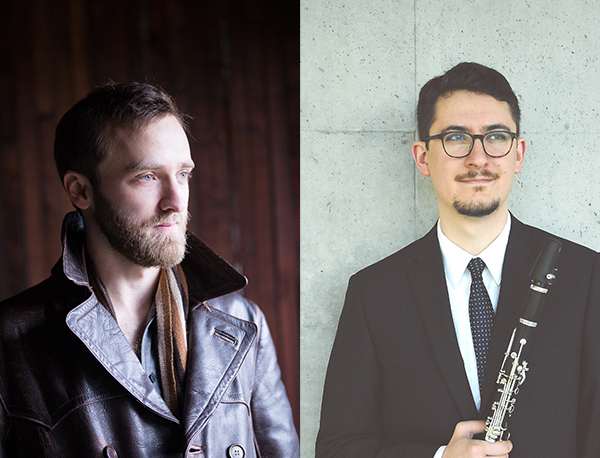 Canadian clarinetist Liam Hockley is a versatile musician, whose creative practice focuses on the creation and promotion of new and experimental music. As an artist for whom “alternative or avant-garde approaches to his instrument are only part of the everyday tool kit” (Georgia Straight), Liam’s repertoire encompasses not only the major twentieth and twenty-first century works for his instrument, but also the results of collaborations with Canadian and international composers on innovative new works across a broad spectrum of aesthetics. Liam has performed at Vancouver New Music, Music on Main (Vancouver), SALT New Music Festival and Symposium (Victoria), KLANGRAUM (Düsseldorf), Stockhausen-Konzert und -Kurse Kürten, the Banff Centre for the Arts and Creativity, NUNC! (Evanston), and the Kuandu Arts Festival (Taipei). Liam has been featured as an Emerging Artist-in-Residence with the Music on Main concert series and his chamber duo (Duo 1010) is the core of the SFU School for the Contemporary Arts Ensemble in Residence for the 18/19 academic year. He has recently completed a Doctor of Musical Arts degree in clarinet performance at the University of British Columbia, where his research was supported by the prestigious Joseph-Armand Bombardier Canada Graduate Scholarship (SSHRC) and a University of British Columbia Doctoral Fellowship. Following music composition, performance, and theory studies [Dániel Biró, David Clenman, Eugene Dowling, Colin Tilney, Gary Karr, Louis Ranger, Gordon Mumma] at the University of Victoria, Max Murray completed parallel graduate degrees in performance and composition at the Berlin Hochschule für Musik ‘Hanns Eisler’ [Thomas Keller, William Forman], and the Leipzig Hochschule für Musik und Theater ‘Felix Mendelssohn Bartholdy.’ As a tubist he has worked across classical and contemporary repertoire [guest of the Staatskapelle Berlin, SWR Experimental Studio, guest of the Orchestra Academy of the Berlin Philharmonic, Lucerne Festival Academy, Axel Dörner], appearing in festivals including Märzmusik [Berlin], Borealis [Bergen], and Musica Nova [Helsinki], and receiving invitations for residencies as an interpreter in the composition departments of Stanford, and Huddersfield Universities. In 2014/15 Max Murray was a visiting fellow in the music department of Harvard University, where he is currently a PhD candidate in music composition [Chaya Czernowin, Hans Tutschku]. As a composer he has collaborated with musicians and ensembles including Noa Frenkel [Den Haag], Annie Gårlid+Matthew Conley+Nathan Plante [Berlin], Kevin McFarland [Colorado], RAGE THORMBONES [New York/L.A. ], Liam Hockley [Vancouver], and Madison Greenstone [San Diego], among others, with works appearing in contexts such as the Gare du Nord «Dialog» [Basel], Klangwerkstatt [Berlin], and HaTeiva [Tel-Aviv]. Since 2016 he has been conductor of Harvard University’s Graduate School of Arts and Sciences’ symphony orchestra. Stephanie Bell is a versatile and experienced flutist, and has played 2nd flute-piccolo in the Victoria Symphony since being offered the position in 2017. Stephanie has performed with the Vancouver Symphony, the Kamloops Symphony, the Lions Gate Sinfonia, the Vancouver Metropolitan Orchestra, as well as with the New York-based Poulenc Trio on their 2016 West Coast tour. Before beginning her professional career in Victoria, Stephanie was a member of many professional training orchestras, including the National Academy Orchestra under Boris Brott (2011, 2013), Orchestre de la Francophonie (2012, 2016), the Orford Academy Orchestra (2014), and the Debut Orchestra and American Youth Symphony in Los Angeles (2014-2016). Also active in the field of contemporary music, Stephanie was a resident guest artist with both the Young Musicians’ Foundation and LA Phil Young Composer programs in Los Angeles. She was a prize winner at the 2015 Stockhausen Concerts and Courses in Kürten, Germany, and was selected to perform at the 2017 Courses with her duo partner Liam Hockley. Stephanie completed her Masters in Flute Performance at the University of Southern California with James Walker, former principal flute of the Los Angeles Philharmonic (2016), and earned her Bachelor of Music in Flute Performance and Music Scholarship at the University of British Columbia (2014) with Brenda Fedoruk, Principal flute of the Vancouver Opera Orchestra. While studying at USC, Stephanie pursued further piccolo studies with Sarah Jackson, piccolo in the Los Angeles Philharmonic. Canadian oboist Kristen Cooke is a versatile performer currently based in Vancouver. She is a Doctorate of Musical Arts candidate in Oboe Performance at the University of British Columbia. Kristen is in demand as an orchestral musician, including frequent concerts with the Vancouver Symphony Orchestra, Victoria Symphony, Kamloops Symphony, and Vancouver Island Symphony. Her orchestral training has included summers with the National Youth Orchestra of Canada, the National Academy Orchestra, the Orford Orchestra, and the Atlantic Music Festival. In 2017, she performed a solo tour of England and Scotland as the Royal Over-Seas League ‘British Columbia Emerging Musician’ including recitals at the Edinburgh Fringe Festival and St-Martin-in-the-Fields. In 2018, she performed the Canadian premiere of Dorothy Chang’s solo oboe work, ‘Still’, at the Quadra Island Festival of Chamber Music. She is an advocate of creative programming, comfortable with both classical standards and the contemporary music of today.